You prerecord lessons and host the content somewhere your students can access it. Students watch your lessons on their devices. At the end of the video you set some work for them. I have run with this process over the last year and a half and in this post I am going to reflect on this process. My journey into flipping the classroom started when I was teaching in a tiny but effective school in rural Northland, New Zealand. The principal had given me the responsibility of teaching the year 13 Maths with Calculus and Maths with Stats courses. Because there were only 5 students doing these courses he could only afford to give me 4 hours a week to teach two courses that would usually require 8 hours. I knew this would be a problem because I would only ever have time to teach and never any time to help students individually. This is when I made the choice to prerecord my lessons and let them work through the course for homework. Then when they came to class I ran it like a tutorial, where I could go through examples and problems and engage with students and their questions. As you can see there are dates when I expect students to be to a certain topic and I write comments on their progress so that they know I am monitoring them. The single biggest benefit I have found from flipping the classroom is the amount of time it gives me during class to spend helping students one on one. In this Algebra topic with my year 9s I get to meet with each student individually virtually every lesson. It means that with a skill such as solving equations, I can be very thorough with checking that each student is expressing their working in a logical and concise manner. Disclaimer: This is not the sole entirety of how I teach, but one practice of many I employ. This year I have started on a new journey, taking on a new job at St Andrew's College, Christchurch, but doing the same thing, teaching Mathematics. One of the biggest differences between this year and all my other years teaching is the way I have connected with other teachers around the world. I have always considered myself a competent social networker, even without the technology we associate with that phrase nowadays. However, now I have become a "connected educator". I guess the connotation "connected educator" has now, is that it is a teacher who engages digital media to connect and collaborate with other teachers everywhere. Before this year, I was still networking with other teachers, but through traditional channels such as my subject association and conferences - in short anywhere teachers would gather together physically. I have still kept up meeting with other teachers in the "real world", in fact even more than before, but an entire other dimension has come about through Twitter primarily, but also blogging, Yammer, and VLN.school.nz. What got me thinking about how I have become connected was when I was looking at the statistics page on my blogger site. 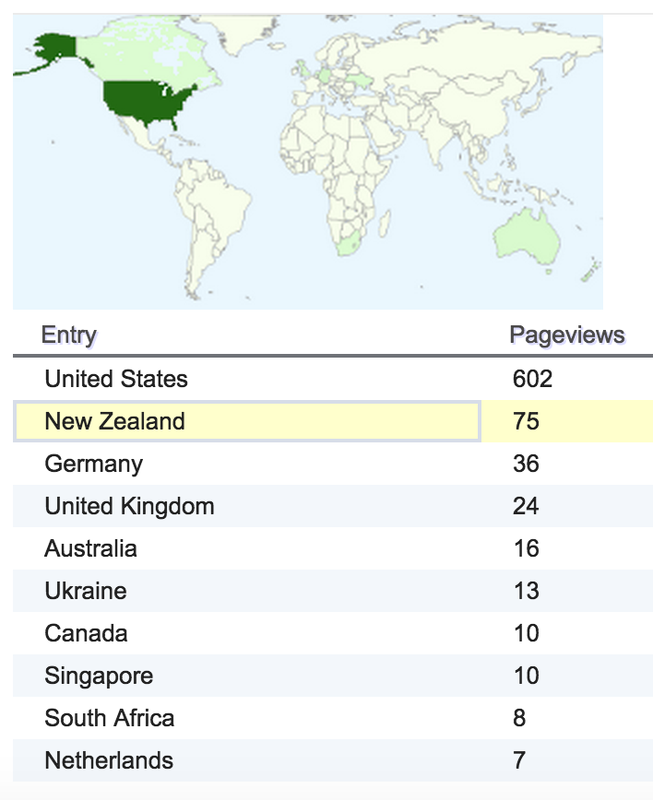 I was amazed to have had over 1000 people view my blog and over 800 on one single post. What is more interesting is where the views are coming from. Views from my own country account for less than 10% of the readership, while the most come from the USA, over 10 000 km away. 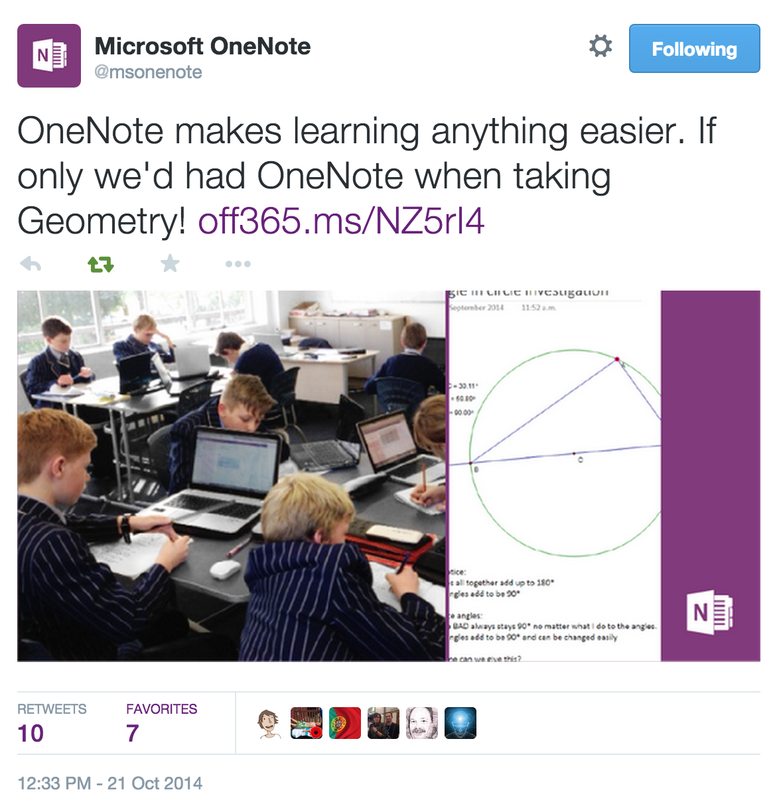 Microsoft OneNote's twitter account tweeted a link to my blog. Only 10 retweets and 7 favourites and then 500 views in three days and about 25 a day ever since. This is what makes me so excited about being a connected educator: what I do in my class room can influence in some small way the practice of others around the world. But perhaps even more importantly, my practice can be influenced by every teacher in the world. We live in an age of democratisation of knowledge. Whether this is good or bad can be debated, but for my part I take an optimistic point of view. I am put in mind of Marcus du Sautoy's story of the Wisdom of the Crowd. The premise is the story of how hundreds of people can guess the weight of something extremely accurately if you average their guesses, but no one individual guesses correctly. I think a parallel can be drawn with education. No one educator can deliver a pedagogically perfect lesson. However, if you took all of our best practices and averaged them out you would end up with something very close to the best possible practice. The only way this can happen is if teachers are aware of the practices out there and are able to pick and choose what will work best for them in their environments. Perhaps the same can be said for students too. They need to be aware of what attitudes and principles makes other students successful and emulate that. In either case we need to be well connected and I would ague this needs to be both with people we meet physically and now online as well. For me, I started really with twitter, getting involved in the fortnightly discussion group #edchatNZ. This led to a physical conference the fruit of which for me was a fortnightly mathematics teachers' discussion group #mathschatNZ. Through these channels I have connected with dozens of educators in New Zealand and abroad, who engage with me online in a similar way to how I bounce ideas of my colleagues in my office. Through this interconnected web is how Microsoft picked up on what I was doing with OneNote and shared it with their 15 000 followers. Dean McKenzie in his blog discusses what this might look like from a student's point of view. If you are a teacher reading this, consider joining your local subject association, getting involved in a twitter group like #edchatNZ or if you are not lucky enough to live in New Zealand, #edchat. Get a Yammer group set up for your school or district. Set up a facebook group for your class. But whatever you do, take care to improve your own practice off the backs of others. Last weekend I was privileged to attend and participate in the Australia/New Zealand Microsoft Expert Educator's weekend in at Microsoft's offices in Sydney, Australia. It was an intense and valuable weekend where I met many like minded teachers. I am quite chuffed to now be distinguished as a Microsoft Expert Educator, so I wanted to briefly reflect on some aspects I found to be particularly interesting to me. Firstly, it is amazing that there are so many incredibly passionate teachers out there who are showing incredible competency in how to become more competent! These teachers all know they need to continually update their practice and push the boundaries to improve the success of their students. They have incredibly ambitious plans, but are also very open about failings they have encountered along the way. I was honoured and humbled to be in such company. An interesting concept I came across from another delegate was Hale at Home by Michael Valentine. I think the concept could have application in my own school that has a sizeable number of boarders like Hale in Perth. Michael has set up a sort of online school that engages with potential boarders while they are in year 7 and 8 to build up a rapport with the students and introduce them to some of the academic life of the college before they attend. I can see this could be an avenue to investigate more fully at St Andrew's. The last thing I will comment on is the design of the Microsoft offices and how it might inspire a modern learning environment in a school. The whole floor levels were wide open spaces. There were no desks "owned" by an employees and they were free to roam about or base themselves at whichever space suited their needs. Such a model requires huge trust from the employer and a great deal of motivation and discipline from the employee. However, as it was pointed out, performance was still a key indicator of success. I reflected on the possibility of having such a set up in school, as I have seen at Hobsonville Point Secondary School during the #edchatNZ conference. At the time I reflect on how the model would require redefinition of how a school operates. Seeing the Microsoft offices did not change that opinion. However, my vision of feral students gaming unsupervised in the corner while teachers roam the halls trying to track some kind of work going on, is starting to be transformed. Now I feel that it could be an incredibly empowering experience for students if they were given some room to be independent and self directed. 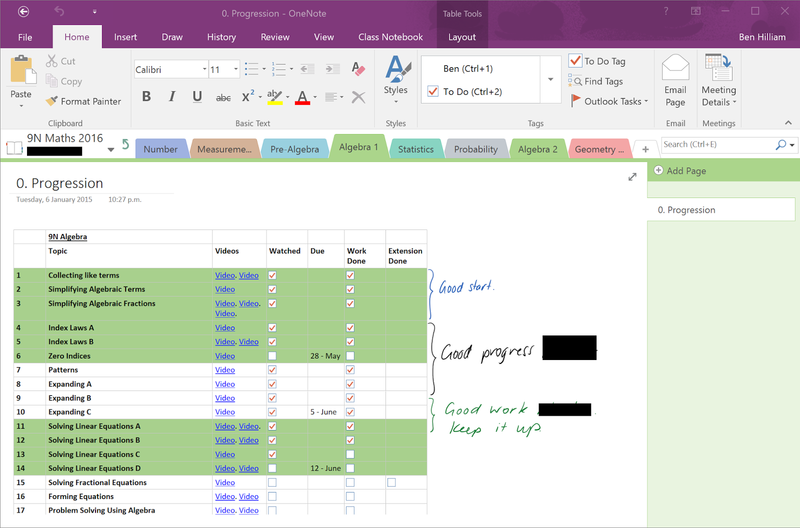 In such a case the teachers' jobs become one of managing this without "putting out the fire"
Throughout this year I have been using Microsoft OneNote with my students at St Andrew's College. Sam McNeill has a fair account of how I have been using it here with my year 9 one to one computing class, I have been constantly reflecting on how I can continue this journey. Using the SAMR model, I have currently been operating in the Substitution and Augmentation stage, where technology replaces some traditional aspects of teaching, such as "Chalk and Talk", but with some added advantage. In my case, having examples, notes and work always live and accessible to students through Microsoft OneNote and also recording my lessons as I deliver them and link them back to my class OneNote. This is a very teacher orientated model and I would like to see students more empowered through their use of technology. In this case the student is investigating circle geometry, with a triangle whose hypotenuse is also the diameter of a circle. Incidentally the program used for drawing the circle, triangle and measuring the angles is Geometer's Sketchpad. While there is nothing revolutionary about the learning happening here, the thing I really like about it is the efficiency. When this task is done without digital technology could easily take up a whole lesson, but this task took no more than 10 minutes. With Geometer's Sketchpad, the student was able to investigate the properties of the triangle by fixing a triangle's diameter into a circle, then vary the two shorter sides while measuring all the angles. When I reflect on where this task sits in the SAMR model, I feel that to an extent it is still mostly Augmentation. But there are aspects of modification. The ability to investigate a geometric rule using Geometer's Sketchpad has modified the way I teach the topic in so much as it is a much more containable and manageable task within the confines of a 50 minute period. 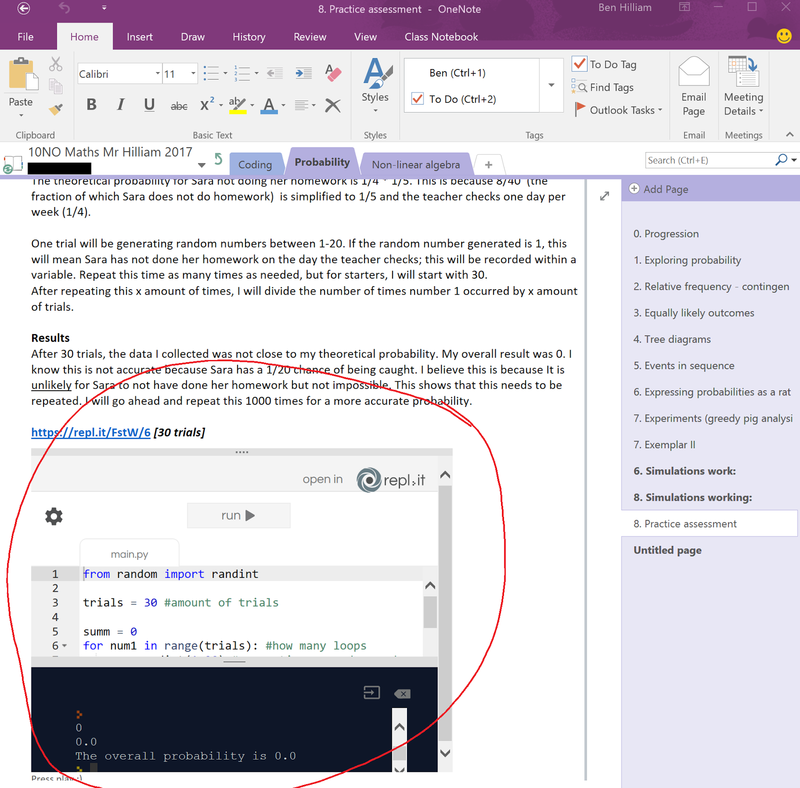 However, the way the student articulates themselves by pasting and commenting in OneNote is augmenting what they would do with pen and paper (and scissors and ruler and compass). As I already know who I am voting for this election, I chose not to attend the political debate. Instead I thought I would inspect the hardware on show at the PBTech stall. One device caught my eye in particular and that was the Asus 8” tablet with intel atom processor and a stylus. Since I have been using a tablet this year and it has been an integral part of my teaching, I am keen to see what is out there at an affordable price. While I would not use the Asus table myself, I immediately saw the potential for it as a student device. Why is it not a teacher device? It is too small. Teachers type a lot and require a large keyboard and screen for things such as reports. The Surface Pro 3 satisfies these requirements and also has an accurate stylus for handwriting. However, as a student device, perhaps even a secondary student device the Asus is spot on. Its size makes it portable. With an intel processor it is able to run a full desktop version of Windows. And most importantly in my mind it has a pen/paper accurate stylus which allows the user to write with their palm resting on the screen. Combined with Microsoft OneNote, and a price of $520 + GST, this makes for a formidable competitor to any other tablet on the market. During this time I ran into Dean Mackenzie and Cathy Kennedy from St Andrew’s and Grant Saul from Westlake Boys’. Our chat centred on OneNote and the wider Microsoft ecosystem. Grant demonstrated OneNote toolbox. All I can say is, this, along with each of my students having something equivalent to the Asus tablet would make my class a dream. 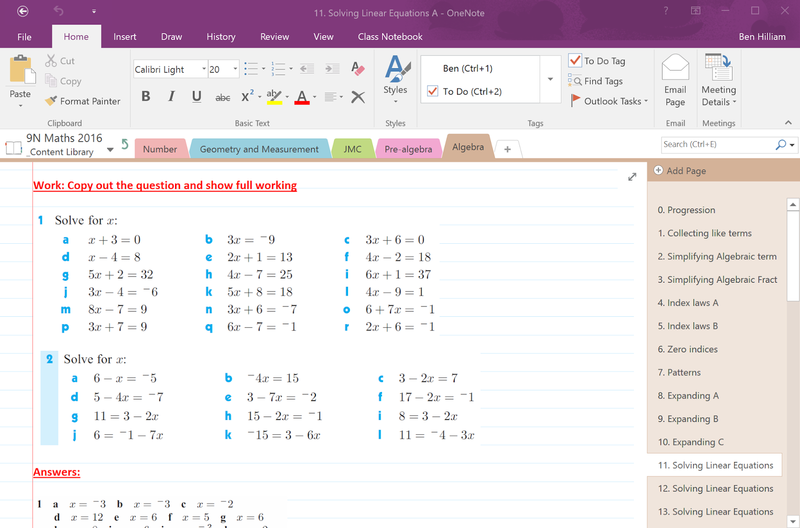 My students already have convenient access to the notes and examples I do in class through OneNote. OneNote toolbox just lets me have that same access to their OneNotes. Cheryl Doig is an ‘ex’ primary school principal. She now works as an educational consultant. She spoke about strategy in influencing others, particularly those above you in the hierarchical structure. Her rationale was that it is teachers at the ‘coal-face’ that have the best ideas of how to progress educational policy within a school, yet all the power resides in those whose time in the classroom has diminished to very little. Her methods were closer to quiet persistence rather than abrupt confrontation. She suggested understanding the way in which those around and above you think and how you can address their requirements as a person. For example, if your leader is a logically inclined individual, avoid engaging in emotional discussions as this will have little bearing on their decisions. Instead you are better off providing reasoned well researched arguments that they can discuss and work through to understand. Equally don’t bog down a ‘big picture’ leader with details or facts around what you want to do. This was an interesting section, giving me plenty to reflect upon.